Not to knock the "Ice Bucket Challenge" (too much, at least), but when I saw how viral that was going, I figured what we should really be doing if we want to improve the world is "challenging" ourselves to take actions that have a few elements missing from that campaign. We should be doing actions that do not overvalue money by framing donations as the answer to our problems; that are relevant to the problems we have, rather than just being gimmicks that attract attention to themselves (as opposed to inspiring greater interest in the cause); that do not make people feel so good about doing pretty much nothing that they have even less incentive than normal to actually get up and do something impactful; that do not fund the exploitation of our nonhuman sisters and brothers, of course; and, well, that are actually some measure of "challenge" to the participants, because no real change comes without a struggle. So we decided to challenge everyone to go solo or with other activists (in addition to a cameraperson) into a space that normalizes speciesist violence and oppression, and disrupt it. As MLK said: "Nonviolent direct action seeks to create such a crisis and foster such a tension that a community which has constantly refused to negotiate is forced to confront the issue. It seeks so to dramatize the issue that it can no longer be ignored." "You're too militant," the broken record plays. Men tried to shame Emmeline Pankhurst into less confrontational approaches, but she recognized anything short of her "militancy" as acquiescence that allowed the suffragette's cause to remain unaddressed. Who does history remember, her, or the ladies who politely asked men to hear their voices while those men made patronizing jokes about them? When the Greensboro Four defiantly sat at the "Whites Only" counter of the cafeteria, a black waitress said to them, "Fellows like you make our race look bad." But who got that cafeteria desegregated? Who sprung up a movement of civil disobediences that forced the issue of white supremacist tyranny onto the front page of newspapers everywhere and into the public discussion that is necessary for public change? Enough with the "you're too militant" nonsense. People have said it every time, and every time they've been wrong. The oppressors have always tried to use that "warning" (that the rebel's message won't be received if they aren't nice and quiet??) to subdue the allies of the oppressed, and too many allies let it deter them from doing exactly what it turned out they should have. Look at history. Confrontation needs to happen. Dramatizing the issue is what gets people moving. Maybe you personally do not feel comfortable raising your voice for the silenced and if so, I hope we can empower you to choose justice over comfort, but if not, and if you will insist that some forms and levels of accommodation are important (though I question how influenced that position is by both risk-aversiveness and speciesism), then fine, if that's how it is that's how it is. But stop trying to gag those who push harder, unless you can demonstrate that major social upheaval has ever happened through saying nothing but "please." We're just trying to make our cousins' voices heard. Stop helping the oppressors silence the oppressed. *I'm going to point out here both that the above-ground disruptions that DxE does are hardly "militant" given the reaches activism can go to, and, more significantly, we humans are not even in the oppressed class of the animal liberation fight - opening that door, sitting at that counter and leading that march are actions of essentially no risk for us (and look like nothing at all next to what the animals will go through if we don't take these "risks"), with (as we can gather from the history of direct action) huge potential gains for nonhumans. The Conjurer by Hieronymus Bosch. While a magician performs, pickpockets steal the audience's belongings. “What is this I have in my hand?” he asks us, holding up a deflated red balloon. “Do you think this balloon, once blown up, will be able to fit inside of this glass?” We pause for a second, looking at the wine glass on the table and then back up at the balloon, imagining the scenario. “No,” we say in unison. “Now, I’m going to test your perceptual abilities.” The magician starts to blow air into the red balloon, and we watch him as it inflates to the size of a large watermelon. We both look down at the wine glass again, measuring the likelihood that the two disproportionately-sized objects will be able to fit together. “You know, I really can’t make this happen without this tool I have, which you may have heard of, called a magic wand. Let me get it.” The magician reaches into his black velvet overcoat with his right hand, while still holding the inflated red balloon in his left hand. We wait in anticipation to see what will happen next. As he fumbles in his overcoat for the magic wand, he quickly pulls out a knife and stabs the balloon. It pops. I’m startled. My mind is struggling to catch up to the rapid movements and make sense of the chaos. After a short lapse, I realize that in the same hand as the balloon, there now appears a bottle of red wine. “What you didn’t notice was that there was a bottle of wine inside of the balloon,” he jokes as he opens the bottle and pours it into the glass. What I didn’t mention in the scene above (a sleight of hand of my own) is that the magician was not only our host in Boston—our first stop on the East Coast tour—but the critical theorist John Sanbonmatsu. As you may recall, I have written about John’s work on this blog before. He has played a key role in my intellectual development on topics of animal liberation and speciesism, and by association, in the development of DxE and the It’s Not Food, It’s Violence campaign. Like Pollan, magicians aim to misdirect the audience’s attention and awareness away from the source of the trick, so that its cause is obscured and appears to be supernatural. Magic, simply put, is an elaborate deception of the senses. John explains to us, “magic has been around for thousands of years,” and it is perhaps one of the oldest and most wide-spread forms of performance art on the planet. Magic, I realized, is not only encountered as a performance on the stage, but pervades every waking moment of our lives. The manipulation of perceptions (also known as “marketing”) is an art that corporations and exploitative ideologies have mastered to build, and justify, their empires. For example, Chipotle and other marketers of “humane” meat, eggs, and milk mislead and dupe the public just like Michael Pollan; they carefully craft slogans and polish stories about animal agriculture that appear benign and just, while diverting attention away from the source of real ethical concern: we are controlling, dominating, and killing other sensitive beings because they are different. As performed in Chipotle’s viral marketing videos, Back to the Start and The Scarecrow, this ethical concern magically vanishes as viewers watch happy animals turned into happy burritos without the pain, fear, and suffering of slaughter. And voilà! Attention diverted, money made, trick complete. Activists in Boston bring the silenced voices and cries of animals into Chipotle, where their bodies are sold. One of our roles as activists is to expose the tricks, and the mechanisms behind them, for what they are: fraudulent and harmful. We need to pull back the shroud and unveil all the props of deception. We need to redirect the world’s attention back to the violence behind the scenes—back to the knife poised to penetrate that poor cow’s throat. On this tour, we are attempting to do just that. We are traveling from city to city to create, connect, and inspire activists to organize actions against species tyranny and violence. At each stop, we are presenting about our experiences in DxE, learning from others, and orchestrating demos for the It’s Not Food, It’s Violence campaign, which has now reached 50 cities in 16 countries. Wayne advises me during the magic show, "Ronnie, we have to focus on what he's doing with his other hand, that's where the trick is!" "Ah," retorts John the magician, "I see that you're a skeptic... That's excellent. Skepticism is what makes a good activist." Linda, a powerhouse animal rights activist at 70 years young, speaks for the animals inside a high end restaurant in Sacramento. I have a confession. I made it a rule over 10 years ago to stop watching animal cruelty videos. They scare me. They haunt me. And they bring me crashing down in despair. From an early age, I was obsessed with animals. I would make friends with squirrels and birds in the forest. I religiously read ZooBooks and everything else I could get my hands on about animals. And to this day, the best and happiest day of my life was the day when my parents finally allowed me and my sister to adopt a dog -- my first real friend of any species -- into our home. So when I see videos of animals being hurt, it's as if someone is hurting my dearest friends. Not just hurting them. Degrading them. Abusing them. Brutalizing them. Torturing them. And then even eating them. The scenes are so bad that it's hard to believe they are even happening. And for those of us who love, and have been loved by, animals..... when we see these scenes it's as if the entire world has turned into a nightmare. I was speaking to my friend Lisa recently as to what motivates us to activism. (DxE will be meeting about this next week.) And above all, for me, it is this deep feeling that something has gone deeply wrong with our society. We have seen what is happening to our friends. And it fills us with a sense of injustice that overwhelms every other feeling in our body. We see these images, these videos, and we hear their terrifying cries. "I'm filled with this sense that I've never seen anything so wrong in my life," Lisa told me. And that deep wrongfulness burns us to our very bone. The problem, of course, is that a fire can only burn for so long. And I stopped watching animal cruelty videos because I could see my hope fading, my cynicism growing, and my hatred for the world growing day by day. (Perhaps screening myself from such videos is part of the reason why I've stuck around for 15 years.) So it was only begrudgingly that I have begun to watch these videos again in order to make the DxE campaign videos that we hope will continue to mobilize people all over the world to action for animals. But there is something different this time around. I don't drown in despair when I watch, despite the fact that I have now seen more such videos in three months (heck, three days) than I had watched in the ten years prior. And the reason is... you. My despair over the nightmarish suffering of our kindred sensitive beings is met with a just as powerful collective resolve: that we will no longer hide how we feel, run to the bathroom with our tears, or make small talk in the face of catastrophic atrocities. I see someone like my friend Linda, a 70 year old activist in Sacramento who looks half her age, speaking confidently and strongly on behalf of our brutalized friends ("This sweet mommy pig does not want to be on your dinner plate. She deserves to live!") in a place of opulence and violence, and I begin to see a path out of this nightmarish world. The nightmare still rages, to be sure, but by recognizing, and connecting with, the legions of activists ready to confront that nightmare with strong words and action, we need not fall victim to despair. We can look at the nightmare straight in the eye and say to ourselves, and to the world, "Your last days are near. We will no longer hide. And my friends will soon be safe and happy and free." DxE is embarking on a journey across the West Coast on a three-week-long speaking and action tour. Starting in the San Francisco Bay Area, we are taking the tour up north, through California, Oregon, Washington and Canada, before heading back south to finish at the National Animal Rights Conference in Los Angeles. At each stop, we will be giving a short presentation and engage with local activists, with an aim at strengthening bonds between, and building an empowered network within, the animal rights community. The days following the presentation, we will be collectively planning and executing actions at places of violence. The first stop of the tour took us to Sacramento, CA, where we were hosted by Adrienne Ramirez, one of the most diligent and hardworking activists I know. When I first told Adrienne about the tour, all she needed to know were the dates, and everything else she took from there! She went around looking for the perfect spot for the presentation, set up event pages on the internet, persistently promoted, and drew a great crowd. The first night we all met at the conference room Adrienne secured, and gave our presentation to a roomful of dedicated activists, both experienced and new. After the talk, everyone in the crowd asked incisive questions, full of personal stories and intellectual insight, which led to a fruitful discussion. By the end of the night, I could already sense a newfound camaraderie, deeper commitment and hope to where the movement was headed. On the second day, we met back up at the same space, joined by some new faces that hadn’t been around the night before. Some of the folks there had participated in DxE demos in the past—as part of the monthly actions for the It’s Not Food, It’s Violence campaign — but there were also others who had never done any type of disruption before. This was their first encounter with DxE’s approach to activism. Though nervous, they also felt the need to break out of their comfort zones and bring the stories of the animals into the very places where they have been most ignored. The first action we planned led us to an upscale restaurant, replete with references to the “humane” treatment of the animals, while simultaneously offering “veal” dishes. We entered the restaurant calmly and confidently, with over 20 activists, and held placards stating, “It’s Not Food, It’s Violence.” Three activists—Adrienne, Angel, and Linda—all held beautiful images of our nonhuman kin and took turns telling passionate stories about the devastating torment these sensitive beings have to endure, as well as painting an alternative vision—a world of species equality, a world of liberation. We then took our demonstration outside, to bring these stories to the surrounding, and very curious, people. After some time, we made our way to another upscale restaurant a few blocks away, where the bodies of animals were proudly served. On our way over, we noticed that the Sacramento police had been called and started following us. This isn’t such an abnormal response, but what happened after truly was. As our demo commenced, police began swarming in droves, with lights flashing, from all different directions. They ended up blocking the street with their vehicles, which looked like a scene out of a bank heist movie. However, nothing happened. With a good liaison, they stayed at bay, and we finished our protest while they stuck around to observe. We couldn’t possibly have been happier with the wonderful turnout for both days in Sacramento. Adrienne and the crew set a very high bar for the rest of the tour that might be hard for other cities to beat! If the passion of the Sacramento animal rights community is any indication of future success, I have total faith that total liberation will become a reality. PALS organizer Saryta Rodriguez is writing a book about the animal rights movement. But she recently published a sneak preview of an interview about DxE. In the interview, Saryta explores the origins of DxE, the importance of "disrupting business as usual", and the influence of two Nobel Laureates in establishing DxE's model of activism. SR: What inspired you to start this particular coalition? Why not just join any of the many pre-existing animal liberation organizations out there? What did you hope to bring to the table that others perhaps do not? WH: There are a million animal groups out there; but what makes us different is primarily that we are squarely focused on movement building. Most animal rights groups attempt to shift particular actors (whether corporate or state) or the public. While we don’t neglect those objectives, we also are keenly aware of the importance of building a stronger and more robust movement to effect real change. I was influenced in this by my studies of intervention into human rights causes. It turns out that most attempts to fix problems have little to no effect. The reason, as Nobel Prize winner Douglass North found, is that institutions—particularly “soft” institutions, such as culture and trust—are the ultimate cause of (and solution for) most social ills. This is for those who are gone. For those whose cries were drowned out in the dark night, whose terror and screams are stuck inside the slaughterhouse walls. The endless pain that you have suffered, the lonely days you stared at the cold walls of your prison, without any hope—this is for you. But what these words do is carry the truth—and that can never be forgotten. Every animal who has been cut-up and treated as no more than a meal by companies like Chipotle, did not want this fate. Each moment they were prodded, kicked, forced into a crate, or loaded onto a truck—they wondered to themselves: Why is this happening to me? When will it end? That is why we are here: to tell Chipotle and to tell the world your story. We are here because we know that your lives have meaning. We know that your desires to love, to play under the open skies, to live in the comfort of a community—are real. And even though your time here was brief, it will not be forgotten. We will NOT let it be forgotten! We will not forget! We will NEVER forget! It's not food, it's violence! Activists in Australia with the message: It's not Food. It's Violence. Photo courtesy of Patty Mark and Animal Liberation Victoria. It's odd and a little awkward when one of your inspirations as an activist joins a campaign you are an organizer for. Part of me thinks that we should all just step out of the way and let Patty Mark run the show! But this is how movements grow. We see the horrors, and we crawl into a dark corner to cry. We pick ourselves up, wipe away the tears, and decide to take action: "No more tears. No more shame. No more lies, and no more pain. It's time to take a stand." We find guides and teachers, who show us tactics, strategy -- and, perhaps most important, ideas -- that we can... that we MUST.... spread far and wide. And if our movement is as strong as I know it to be, we see those ideas blossom even in the most unexpected of places. Patty Mark performing an open rescue. It's not about how we 'care for' or treat the billions of animals we mass produce to keep in line, it's about erasing the line altogether. Humans are incredible animals, but we can also be a very selfish species--we so often put ourselves first. We can and must open our minds and hearts. Promoting and/or consuming animal products deepens the rut that is grinding down our humanity, our health and the future of the planet. Help us step across the line that separates human from non-human animals, and erase it all together. Dog or cat, human or rat, we are all equal. We love our mothers. We miss our friends. And we are desperate when we are alone or in pain. And we all have the basic right to be free from violence. Thank you ALV and Patty. And thank you to all the activists all over the world who fight for the rights of animals. It is because of you that, some day soon, our animal friends, who have for millennia lived in downtrodden communities that lie underneath -- broken down and brutalized by misguided traditions and bloodthirsty corporations -- finally see the light and freedom that they have always deserved. 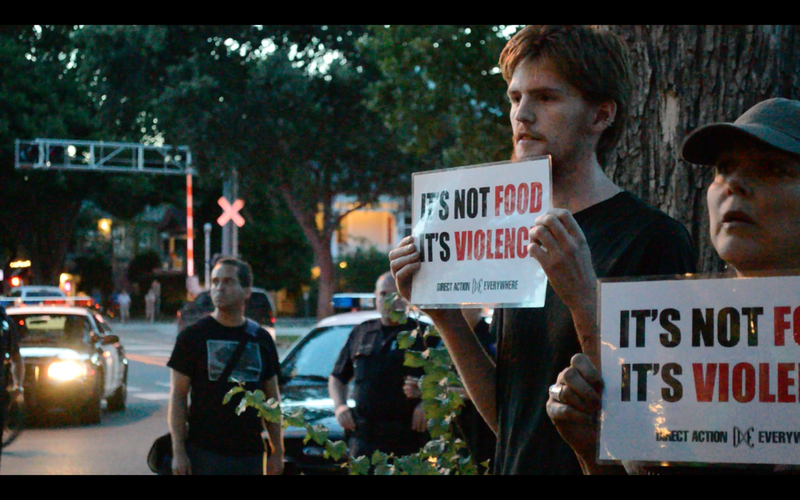 Ronnie (on the right) at a recent It's not Food, It's Violence demonstration. Ronnie Rose, co-founding organizer of DxE, is not a name you'll necessarily know. But he did the remarkable video work that launched DxE into the world, with a splash, in early 2013. And it was conversations with Ronnie that shaped, and created the momentum for, the formation of our grassroots network. Since that time, Ronnie has been, in many ways, the theoretical voice of DxE. You might have read his powerful piece, The Soul of the Animal Rights Movement is Up for Grabs, or heard about DxE's graphic images study, which we commissioned in part because of a relationship Ronnie struck up with the brilliant political scientist Tim Pachirat. But in more ways than one, Ronnie has continued to be a key contributor to not just DxE's growth but, perhaps even more important, its anti-speciesist integrity. Ronnie has helped us maintain our strong commitment to animal liberation -- in our words, in our practices, and (especially) in our tactics and strategy. - some simple advice for new vegans. Check it out, and make sure you subscribe to RGB Vegan on iTunes! There has been an unusual sight over the past few months in fast food chains around the country and (increasingly) around the world. Animal rights activists, with DxE and otherwise, are taking their message inside the places that serve animals' mutilated bodies. Why? Speaking out while others are eating, while not illegal, is a violation of one of our most important social traditions: breaking bread. When we sit down to eat, we seek nourishment, and comfort, and peace. We bond with those who are around us, and set aside our differences. Michael Pollan, among others, has written about the importance of “table fellowship” and how socially uncomfortable and alienated he felt in his brief spell of vegetarianism. Pollan’s solution? Don’t just give up on saying anything about the ethical problems with eating animals; give up the vegetarianism, too! The mainstream animal rights movement has, until this point, mostly accepted Pollan’s framing of the issue by admonishing us for speaking honestly about eating animals… while animals are being eaten. And there are superficially plausible reasons for this. The sociology that Pollan discusses -- the importance of eating to social cohesion and identity -- is undisputed. Food restrictions have been used for thousands of years as tools of oppression and exclusion. Many religious traditions would forbid even the presence of those who handled foods that were deemed “unclean.” And there is an undercurrent of intolerance, and even outright racism, to many of the criticisms of foreign food practices. In a free society, diverse eating practices -- like diversity in our other basic needs such as autonomy or physical intimacy -- should be not just tolerated but positively encouraged. As Chipotle emphasizes, vegans and carnivores (including, apparently, multinational corporations) must… unite! DxE activists around the world taking the message of animal liberation inside the spaces that profit off their exploitation. But is there something missing in Pollan’s beautiful story? Why are activists all over the world breaking this ancient tradition, and speaking out in defiance of “table fellowship”? One example of this. At our last SF protest on the It’s not Food, It’s Violence campaign, a San Francisco police sergeant politely approached me, in front of the closed Chipotle, and asked, “Does anyone want to get arrested?” The notion behind this was that civil disobedience has become so domesticated that the police tolerate and even encourage it, and want to assist activists in making it happen! Protest, when so cleanly integrated into the status quo, becomes mere theater, and the inspiring demonstrations of the 1960s are transformed, in Wolf’s words, into a bizarre Disney-land fantasy. Going inside a restaurant, and breaking the rules of Pollan’s table fellowship, does not just convey a stronger and more confident message, however. It also feeds a cycle of viral storytelling that has been vital to every movement’s growth. There are too many examples of this from previous social movements to even count. But here are a few that come to mind. The first four students to perform a nonviolent sit in were met with hostility even by fellow people of color. “Fellows like you make our race look bad.” But though controversial, their story took off… and eventually triggered a massive wave of sit-ins around the country. The pioneering feminist Emmeline Pankhurst was widely criticized for her astonishing acts of defiance, including arson and vandalism on the British Parliament, against a patriarchal society that denied her the right to vote. But strangely, for all the hatred against her, people could not stop talking about her and her campaigns. Finally, and more recently, a seemingly ordinary Tunisian fruit vendor, in defiance of social norms, doused himself with gasoline in front of the governor’s mansion and burned himself alive. People said he was “crazy.” But his small act of defiance, triggered a movement, the Arab Spring, that changed the face of the world. Conflict and controversy, in short, feed a campaign cycle. “Young people distribute information calmly about economic inequality” would never have reached even a college newspaper. “Protesters Occupy Wall Street!”, in contrast, took over the New York Times. Direct Action Everywhere’s own growth is an example of this phenomenon. Despite being a grassroots network with no resources and only a handful of founding Bay Area members, we have seen explosive growth over the past few months In part because we have been willing to tread where other groups refuse to go, figuratively and otherwise. We have been willing to breach the traditional rules of table fellowship and confront animal abuse in the space where it’s most regularly and obviously glorified. Love or hate us, that helps us get our issue on the table, and in a strong and uncompromising way that sets our movement up for long term growth and success. As social animals, we humans are heavily influenced by the behavior of our peers. And this as true of activists as it is of other people. So when we see a movement comprised entirely of passive action, we become passive ourselves. When we have a movement that socializes its adherents to “not make too much of a fuss about this,” then we will be inclined towards complying with the social norms of the day. And worse yet, as the groundbreaking psychologist John Jost has shown, subconscious biases will allow us to rationalize this sort of accommodation as good for the world. Going into stores, rather than merely standing outside, is a way for us to send a jolt of electricity through our own movement. So many individual activists have shared with me the empowering effects of demonstrating in places where they had previously been scared to demonstrate, of speaking in places where they had been previously been scared to speak. And there have been powerful empirical demonstrations of this effect, even for viewpoints and movements that have little substance behind them, e.g. the Tea Party. Speaking loudly and proudly in defiance of social convention, it turns out, inspires others to do the same. And that, perhaps more than anything else, is why we encourage our activists to step outside of their comfort zones, past the boundaries of tradition and the table fellowship, and into the stores that our selling the dead bodies of our friends. Something Diane wrote, many months ago when she first began to participate in DxE’s events, has resonated powerfully with me over the past few months. I don’t remember the exact phrasing, but the words were something like this: “Change begins when you push yourself out of your comfort zone.” Those words wonderfully summarize my thoughts on the matter. We simply have to push boundaries -- indeed, create a movement that pushes boundaries -- if we want to see change. Diane's story shows the power of pushing boundaries in making change. For Diane, that has meant regular participation in our demonstrations and an increasingly vocal role -- and breaking the rules of Pollan's "table fellowship." We want you to do the same. Because it’s only with your support that we can overcome the inertia of the table fellowship -- and finally bring direct action for animals everywhere.